Hulk is on the run again, so Banner hides in the Latverian Embassy, which naturally leads to a Doom vs. Hulk story. Doom tricks Hulk’s pursuers by sending a Hulkbot (he happens to have one handy) out to fight, and be killed by, the U.S. Army. 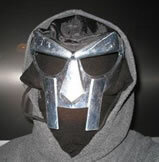 Doom takes Banner to Latveria and experiments on him with a mind-control device. Doom brings his childhood sweetie Valeria in to show how he now has his own slave-Hulk, because that always impresses the girls, but instead Valeria frees Hulk, who saves her from Doom and then runs off. “Do not worry, woman, the Hulk is here!” may be the greatest “Hey Kool Aid” line in history. Also, we learn that Doc Samson’s gamma-induced strength is tied to the length of his hair.